(TB311RW) Team Rod & Tod w/ Kaboom 2009 Geocoin - Todie's Wild Ride II: Your Mirrors Save Lives! Todie's Wild Ride II: Your Mirrors Save Lives! In the hands of amynalex. Use TB311RW to reference this item. 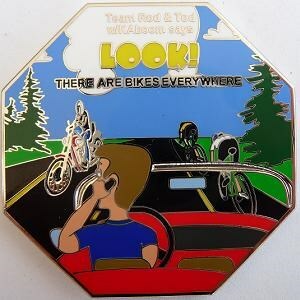 This mission of this coin is to raise awareness for motorcycles sharing the road with other vehicles and the importance of wearing a helmet while riding. As motorcycles and bicycles are much smaller than other vehicles, they can often be difficult to see coming up on you from behind. Be sure to check both side mirrors and your rear view mirror before any lane changes of moves. You never knew who may be there! Save lives! Gallery Images related to Todie's Wild Ride II: Your Mirrors Save Lives! found in lovely Lake Tahoe. Will drop soon. Dropped in SLT47 Is My Fly Open? Retrieved this from what was a very spooky cache spot. But, made the grab, and will place this good looking coin soon. Thanks! Funniest thing - I broomed this coin to the Incline Village travel center cache as Spongehead was visiting nearby Sierra Nevada college. The coin has now been broomed right back down to Cathy's in Oakland...which is where it left from. Alright, I will broom it out of here again and see if we can send it on its way. Cool message and coin. Will move along soon.